prehm modellbahn shop - Art.Nr. 550152 - Young Pioneer with Flag. By popular demand of our Garden Railroader in the east, something again arises "Nostalgia of GDR". The three figures in plastic can be put together to form a group (also several). The colors in the photo are still changed, so get the two young pioneers a white shirt and the FDJler, with GDR flag, a blue shirt. By popular demand of our Garden Railroader in the east, something again arises "Nostalgia of GDR". The three figures in plastic can be put together to form a group (also several). 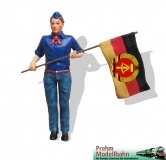 The colors in the photo are still changed, so get the two young pioneers a white shirt and the FDJler, with GDR flag, a blue shirt.